Minn in her favourite place – my veg patch. 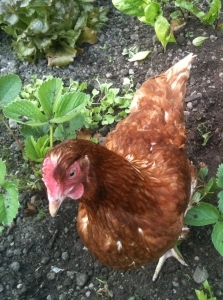 A couple of weeks ago my favourite chicken, Minn, came to a sticky end. I was inside when I heard a blood-curdling squawk and saw something flash past the window. I raced out to see a spaniel trotting down the field towards the shore, a bundle in its mouth and a trail of downy feathers in its wake. Ginger feathers. My heart sank. ‘Not Minn’, I heard myself say. ‘Not ginger Minn.’ I watched as a man, the owner, wrestled Minn from his dog’s mouth and quickly, professionally, twisted her neck. He trudged up the field towards me, the dog slinking behind. Clearly mortified, he apologised and – in a show of manly practicality – offered to pluck her. My bottom lip trembled. ‘No! I couldn’t eat her. She was a pet’, I cried, my voice breaking. The man looked uncomfortable. Back at the cottage Marilyn was running in circles crowing wildly and Martha, the nervous one, was nowhere to be seen. I eventually found her shivering under a bush. Reunited, they soon got over their fright and the loss of Minn (it took all of about, oh, five minutes), I didn’t though. I really missed her. Bereft seems a dramatic word to use – she is, or was, only a hen after all – but that’s how I felt. I missed her bounding out of the hen hut in the morning, first to the food, waiting patiently at the back door for a snack, clucking contentedly as she nibbled on a strawberry or two. Yes, Minn had a healthy appetite. She was also the boldest of the bunch. The trusty trio went everywhere together, exploring further afield (they were spotted on the beach one day) with Minn out front like an intrepid tour guide. Nothing seemed to scare her. Mum reckons that’s why the dog got her instead of the other chickens – she stood up to (maybe even took on?) the attacking mutt. Martha and Marilyn stick closer to home these days. Minn was a great layer. One speckled brown egg a day without fail. I like to think this is because she was a happy chicken. Although her life was short, it was a sweet. She ranged free, taking dust baths in the vegetable plot, scratching on the road, visiting my neighbours’ gardens for a change of scene. It allowed her to shine. I’m quite a carnivore, but I haven’t been able to eat meat since Minn died (apart from one chicken sandwich when I forgot). I think of her face, cocked sideways, intelligent little eyes looking up at me – a personality. 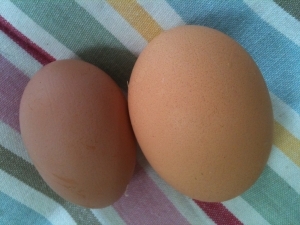 One of Minn's monster double-yolker eggs. As well as uncovering my inner vegetarian, I’ve one other thing to thank Minn for – home-made lemon curd. I tried making it one day when I was over-run with eggs. It’s the most delicious thing in the world: creamy, silky, tart and probably not very good for cholesterol levels. So in memory of Minn the magnificent chicken, here’s the recipe. It’s dead simple to make. You’ll need the zest and juice of four lemons, four large eggs, 350g caster sugar, 200g unsalted butter and I dessertspoon of cornflower. Whisk the eggs in a saucepan, then add the rest of the ingredients and place over a medium heat. You now need to whisk continuously until you feel the mixture thicken – it’ll take about eight minutes. Give it another minute, then remove from the heat and pour into your jars, cover and store in the fridge. It only keeps for two weeks, so you’ll need to scoff it quickly (Minn would have). Polphail village, where no-one's ever lived. At the top of my lane there’s an abandoned village. It hasn’t been abandoned by its residents – no-one ever lived there – but by, well, I don’t know. Who has abandoned Polphail village? Someone must have, because it has sat, slowly decaying, for nearly 40 years now, unlived in and unloved, an ugly blot on a beautiful landscape. It’s the strangest place. It was built in the early 1970s to house the 500 workers that were needed for the oil rig construction site just round the coast, where an enormous hole had been dug to create a dry dock. The plan was to build the rigs and then float them out of the loch and up the coast to the North Sea. But, despite the millions of pounds of Government money pumped into the project, the site never went into production. It seems that somebody discovered – a little late in the day – that Loch Fyne’s tides were too treacherous for floating oil rigs. 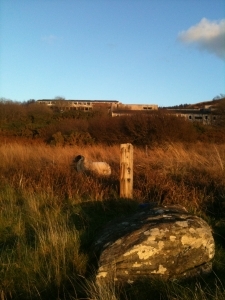 The village is home to a few scraggy sheep and a bat colony. There was talk (perhaps even a promise) of the village being knocked down and the area returned to its original state. But it was sold into private hands, sold on again. Stories came and went about it being transformed into a hotel, into apartments. Whispers of change. But nothing changed. And then as the years went by, I stopped noticing it. Or maybe I just stopped looking. Until the other day, that is, when I walked past and something drew me in. It’s much bigger than I’d remembered, but instantly familiar. 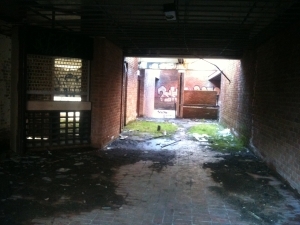 We used to play here as kids, running down the corridors, our shouts echoing around the cold, concrete spaces. It was brand new back then, half-fitted out with light bulbs and towel rails and wardrobes. I didn’t have the words to describe it at that age. My older self would say functional, Soviet, stark. It's a dank, desolate place. It’s desolate now. The grey walls are stained and streaked with the years. The windows are long gone, apart from a few shards of glass that cling like rotting teeth to the frames. I peer inside. A wardrobe door swings half open, a ladder leans against the wall, an old sofa, floral pink, lies on its side and wires hang from the roof. Bright green moss, as thick and plump as a carpet, covers the floor. Further round there’s a kiosk, its shutters down, where cigarettes were never sold, giant washing machines and a canteen, the floor slimy with stinking mud. It’s quiet as I stand here, but it’s not peaceful. It’s sad and lonely and strange. Emptiness clings to the crumbling walls and hangs in the fetid air. It feels as seedy as the old caravans that have been left to waste away, mouldy curtains drawn shut, in the scrub at the back. Agents of Change did some great graffiti. And then there’s the graffiti. In 2009, the owner of the site announced that within a year demolition would clear the site and 270 new homes would be built. 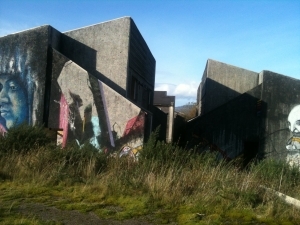 Six street artists known as Agents of Change got permission to decorate Polphail’s battered walls prior to the demolition. Of course the demolition didn’t happen. 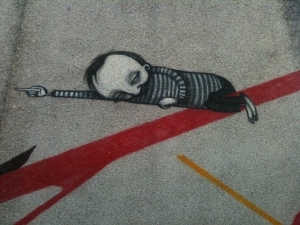 Polphail’s still standing and now wears graffiti like a grey-suited man wears novelty socks. Not to say the graffiti isn’t good – it is. It’s brilliant and witty and clever and some of it’s very beautiful. But it was meant to be one last artistic hurrah before the whole place got knocked down. Now the fading art adds to the sense of dislocation, of something imposed on a place, not from it. 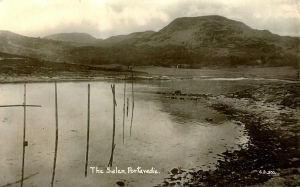 The Salen before it was dug out to create a dry dock that was never used. And what of the hole? It housed a fish farm for a while. Then a few years ago it became a spanking new marina. It’s really quite nice – all modern design, clean lines and bobbing boats. It’s a shame, though, that I never got to see the Salen – the sweep of sandy bay that was dug up and wiped out to make way for the hole. I was born too late. My gran used to say how she’d loved wading here at high tide, when the warm water would wash in over the soft grass. I suppose at some point, as the generations pass, the Salen and its stories will be gone from memories and maps. And who will know, when there’s no-one to remember, what this landscape once was; that it had ever changed.